The factory rubber bushings get dried out and worn out. The rack gets sloppy when bolts down. Just expected wear and tear on our Supras. The only way to get these bushings and sleeves from Toyota is to buy a $970 new power steering rack! R2 Racing offers you a practical solution here. 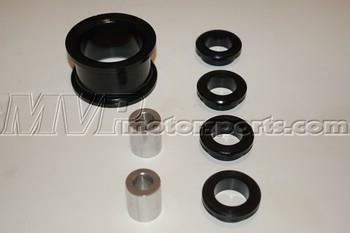 Replace all your steering bushings in one step with this kit, and bring back the “new” feel to your Supra’s steering! We realize that a Steering Rack Bushing Kit does not belong in this sub-section of our website, but we currently do not have a better place to put it.